If you were at the first night of Munchkin Tavern at Gen Con, you can probably stop reading. But if you weren't, this is where you find out about two 2017 releases that Andrew Hackard revealed at the Tavern. 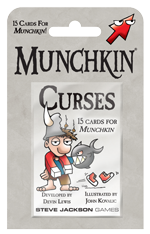 First up is Munchkin Curses, a new booster by Devin Lewis. Everyone loves Curses! The feeling when your opponent kicks down the door and reveals a Curse, or when you play one on a fellow munchkin, is unparalleled. That's why we loaded this pack with 12 new Curses, a couple Monsters, and a Curse Reverse. Be careful though, your opponents want to curse you, too. The next is a return to one of the happiest, and weirdest, places. 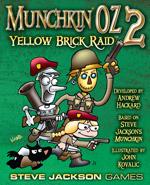 Munchkin Oz 2 - Yellow Brick Raid finds the munchkins back in the land of, well, munchkins! This 52 card expansion adds a plethora of new cards representing even more of the world of L. Frank Baum's 14-book series. Because who has time for 14 books? It's much easier to just play Munchkin Oz! Look for these packs in 2017, and remember to visit Munchkin Tavern here at Gen Con!